Pricebusters Saving Your Hard Earned Money: Best Buy Now Selling Personal Care Items! Best Buy Now Selling Personal Care Items! There is an interesting deal available through BestBuy. Seems they have started carrying personal care items and right now they are offering $10 off when you spend $20. Offer available May 31- June 13. There is free shipping when you spend more than $20 also! 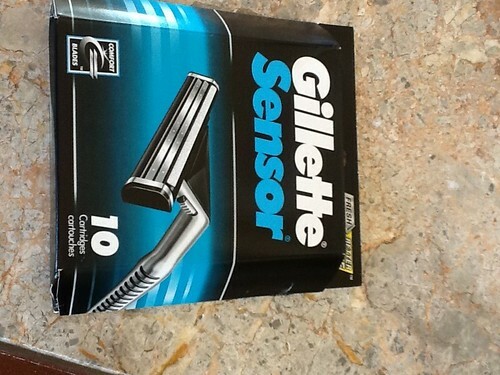 Something I am interested in is the Gillette Sensor razor cartridges as they are expensive and hubby is almost out. I am going to do some price comparing today and I will repost here later. Update:After the $10 off I am only saving a few dollars on the razors, but a few dollars is a few dollars! Wow! I ordered these on June 5 and they came today, June 7! Total $14.98 plus tax for a grand total of $16.78. The cheapest I found them in store was $20.27(includes tax). How about you, did you find something to use this deal for? Covergirl makeup is 30% off. For example Lash Blast Mascara is $8.99 but once you add it to your cart it is $6.29. Right now at Superstore Lash Blast Mascara is $6.87 and there is a $3 coupon. Plus if you shop today at Extra Foods you could get an additional 10-15% off! All that to say it is probably best to check out the prices of the items you might like to buy and see if this is a good deal for you! Quantities seem limited on most items. Grad Photo Book For Free? Saving Money on Cell Phones This Weekend!